A portrait of Lucrezia Crivelli? Although I have seen several reproductions and countless versions of the image in books over the years, I had not seen La Belle Ferroniere in the flesh until January 2012. Even in rooms dedicated to Leonardo’s paintings, it radiates from the gallery walls. This along with the Lady with an Ermine strikes me as being one of the greatest portraits of all time, it is stunningly beautiful. The painting is reported to be a portrait of Ludovico Sforza's mistress Lucrezia Crivelli, however, the identity of the sitter is by no means certain. La Belle Ferroniere was the nickname of a mistress of Henry II of France, and it is possible that the painting could be Isabella of Aragon. Ludovico’s consort Beatrice d’ Este is also a candidate for the identity of the sitter. 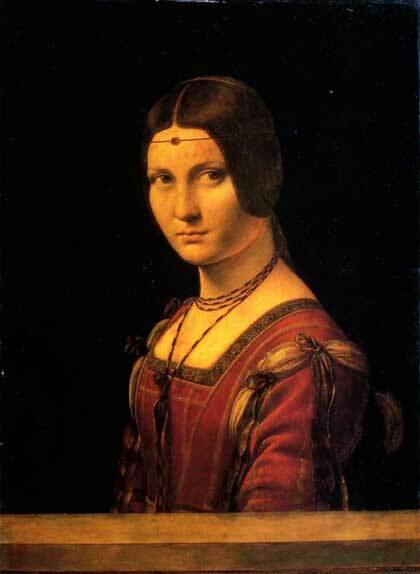 However, it is known that Leonardo painted a portrait of Lucrezia Crivelli and it is likely that this is that picture. The sitter gazes out from a dark almost black background. Only her head and shoulders are illuminated by a light from the front, she is almost lit by the viewer’s eyes. Her head turns with a twisting motion to her left and her eyes also gaze to the left complementing the sense of movement within the picture. The features are wonderfully proportioned, Leonardo has achieved an astonishing smoothness of finish in the facial tones. She wears a Spanish costume, popular at the time, and a decoration of beads around her neck. The lower part of the figure is concealed by a parapet, this gives the sitter a little extra depth. The vitality and beauty that Leonardo has achieved with this portrait were acclaimed at the time when it was first created, the painting’s power to astonish and delight the viewer has remained unabated for more than 500 years. Look at the direct gaze of the sitter. It suggests a relationship between The subject and the viewer, this adds personality to Lucrezia, she seems very human and quite vulnerable. It has been suggested that this work could be by Giovanni Antonio Boltraffio, Leonardo’s pupil, but the modelling of the face is pure Da Vinci.